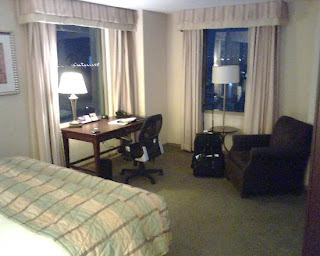 I recently stayed at the Hyatt Penn's Landing on business for one night. I was a little reluctant to book here based on some reviews and I generally have a rule that I wont stay anywhere that didnt score a 4.0 overall unless I know differently about the hotel. I was pleasantly surprised by the hotel. 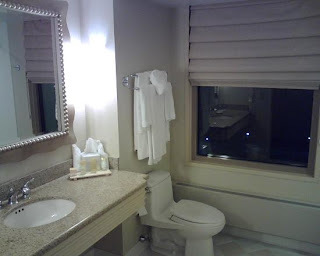 I found the rooms to be wonderful and large with a great bathroom including a window (I booked a waterview king, dont know if that makes a difference). The room had a great view out of all the windows of the river and ships and it was a corner room with three windows in the bedroom and 1 in the bathroom which is actually really nice to have some sun in the bath in the morning. The room was very well maintained and comfortable. The A/C worked outstanding and kept the room very cold which I like for sleeping. The bed was very comfortable and everything was up to date and working. The wireless internet was 54 mbs and had a great a great signal, no problems at all with that. Sometimes with wireless only hotels you only get 11 mbs, a slow connection but this one was up to date for sure. I ate in the restaurant and other then being a little pricey the food was very good. The staff was very nice and accommodating. I would have no problem staying here again.